Even a flea preventative isn’t an absolute guarantee your dog won’t pick up fleas. Your dog may have become infested playing in their own yard, during a walk in the park, or they may have been spread by another pet. 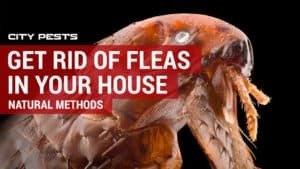 Fleas are hardy, multiply quickly, and are great at hiding but you shouldn’t have any trouble getting rid of fleas on dogs in your household with fast action. Want to know how to get rid of fleas on dogs? Start with a flea shampoo, spray, or powder. Start your pet on a preventative treatment that kills and repels fleas like an oral medication or topical product then treat the rest of your home to kill eggs and larvae. Here’s everything you need to know about getting rid of fleas on dogs once and for all. Killing fleas on dogs is the easiest part about handling a flea infestation in your home. There are many treatment solutions that can kill adult fleas, larvae, and eggs on your pet without harming your dog. The most important thing to do is avoid using too many chemical products at once. Some insecticides can be dangerous, even those marketed for use on dogs. If you use chemicals, only use one at first. You should also avoid Propoxur and TCVP products if you are concerned about your dog’s health. A flea shampoo is one of the best and most affordable ways to immediately treat a flea infestation. With a flea bath, you can be sure you are removing fleas from your dog’s coat while improving their comfort by soothing skin irritated by a flea allergy. I recommend the Vet’s Best Flea & Tick Shampoo (see on Amazon) which kills ticks, adult fleas, eggs, and larvae on contact. This shampoo uses natural ingredients and no added fragrances to deodorize your dog’s coat and prevent skin irritation. To use a flea shampoo, you will need to apply the shampoo to your dog’s entire wet coat and work into a lather. Massage the shampoo into your dog’s coat or allow it to sit for at least 10 minutes before rinsing. 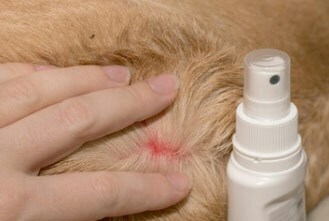 A flea spray is an affordable way to treat fleas on your dog although it isn’t the most effective. I recommend using a flea spray only between baths or to treat items in your home like your dog’s bedding. 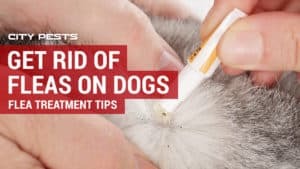 You will need to spray the product over your dog’s entire coat, including the neck, around the ears, and along the tail. To treat their head and face, spray the product on a washcloth and rub gently. Flea powders work like sprays to kill fleas and ticks. Most flea powders repel fleas but also kill them on contact. Most powders are safe to apply directly to your pet but I feel they are best used to treat flea-infested pet beds, carpets, and other objects. When applied to your pet, you are unlikely to achieve even-enough coverage to kill all fleas because they must touch the powder to be killed. Flea collars are primarily designed to repel fleas but a collar can also kill fleas already on your dog, depending on the ingredient. The Bayer Seresto dog flea collar is my top choice for a dog flea collar because it contains imidacloprid and flumethrin. This combination has been found to kill fleas within hours. It against adult fleas, larvae, and eggs to completely break the lifecycle. 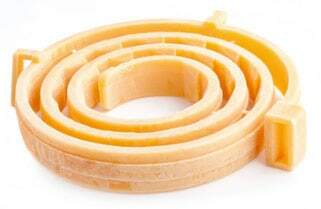 You can check out other recommended flea collars here. Topical treatments are in liquid form and applied between your dog’s shoulder blades. Topical treatments are effective at preventing current flea infestations and repelling fleas in the future. Topical flea solutions like K9 Advantix II usually come in 4- or 6-packs and each application provides 30 days of protection. Pyrethroids. These organic compounds can be listed under many names and they’re often used in natural flea treatment products. Pyrethroids should only be used on dogs, not cats, and never in a household with cats. This ingredient kills fleas, mites, and ticks. Imidacloprid. This active ingredient kills adult fleas and larvae on contact by interfering with the nervous system. Fipronil. This ingredient damages the nervous system of fleas and ticks to paralyze them. It is released over time, usually providing 30 days of protection. Oral flea medications are effective and fast-acting. Treatments like Frontline Plus include a medication that travels through your dog’s blood and to the skin to kill fleas when they bite. You can also use a combination treatment like Trifexis to prevent heartworms and other parasites but heartworm medications require a prescription from a vet. Spinosad kills adult fleas by overstimulating the nervous system. This ingredient is also used to treat human head lice but it shouldn’t be used on dogs with epilepsy. Lufenuron does not kill adult fleas or ticks but it does kill flea larvae. This type of oral medication won’t kill fleas already on your dog but it can be used after a flea bath. Nitenpyram kills adult fleas in as little as 30 minutes. This ingredient is a good choice for treating a current flea infestation but it won’t offer long-term results. Vets often use nitenpyram for killing fleas on dogs quickly. Dog & Cat MD Maximum Defense QuickTabs (see on Amazon) use nitenpyram as an active ingredient. According to a study published in Veterinary Parasitology, oral flea medications are 99.9% effective while topical treatments are only 88.4% effective, possibly in part due to incorrect use and room for error. After killing fleas on dogs in your home, you will need to treat your home as well. Fleas don’t just remain on pets; they lay eggs on bedding, flooring, and other surfaces. Before long, the eggs will hatch and the flea larvae will find their way back onto your dogs, cats, and even your bed. Once an adult flea bites your dog, it will lay up to 50 eggs per day, most of which fall on the floor and hatch into larvae. Flea larvae can grow in bedding, carpets, and dark areas of your home, feeding on debris for about 10 days until they transform into an adult flea that’s ready to find a host. To combat your flea problem and prevent your dog from being reinfested, take the time to get rid of fleas on dog bedding, carpet, your bedding, and other surfaces in your home. Washing your bedding with detergent is a simple way to kill fleas at all life stages, including eggs. 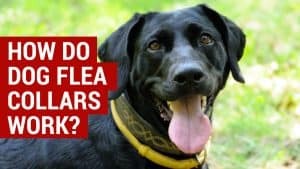 Your dog may have brought fleas into your bed if you notice flea bites above your knees. Carefully scoop up your bedding into a sealed plastic bag and dump directly in your washer, washing on the hottest setting. While the bedding is being cleaned, use any of the solutions below to treat the rest of your bedroom and home. Vacuum your carpets, bare floors, and upholstered furniture thoroughly. Seal and throw away the vacuum bag when you’re done. Use a flea spray to kill adult fleas on contact. These sprays can be applied to carpets and furniture. They’re also effective to get rid of fleas on dog beds. Vet’s Best Flea and Tick Spray is a good choice if you want a natural, chemical-free product that can also be used on your dog. After spraying, you can see the fleas coming up from your pet’s coat and dying. Flea carpet powder is an alternative to a spray that can kill and repel fleas on carpets, upholstery, pet bedding, and even pets. What Kills Fleas on Dogs Instantly? There are two effective solutions for getting rid of fleas on dogs almost instantly: a imidacloprid/flumethrin flea collar and flea baths. 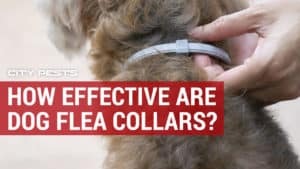 Collars are designed to kill fleas within 24-48 hours but research shows this chemical combination can be immediately lethal. A thorough flea bath is a better option for making sure all fleas on your dog are killed after 10 minutes of exposure. What Is the Very Best Flea Treatment for Dogs? The best flea treatment for your dog involves a multi-faceted approach. No product will completely prevent fleas from returning so it’s recommended to use a combination of options. Do not use multiple chemical products, however. Use a flea collar, oral medication, or topical product along with changes to your landscaping and vigilance to guard against fleas. What Do You Do When Your Dog Gets Fleas? Fleas lay up to 50 eggs per day so fast action is important. Start with a flea and tick shampoo to kill fleas currently on your dog. Use a medicated treatment to kill any remaining eggs, nymphs, and adults that may be on your dog. A preventative flea treatment like a monthly topical can keep fleas from returning. Don’t forget to treat your home with a flea treatment. PrevPreviousHow Effective Are Dog Flea Collars?